Powered Paragliding across Florida sky - f/4 ISO 200 1/400th manual exposure modeA few nights ago I dreamt I was hired by The Devil for a photography shoot. He appeared as a small wall clock with large, comical eyes that turned red with anger when I taunted him about doing the shoot the way I wanted. I knew somehow that The Devil could not touch me, unless, as it said, I dared go to a mirror and be so bold. Freedom on the edge of danger. That was the feeling. I could be bold because I knew I could not be touched, and that I could escape at will. 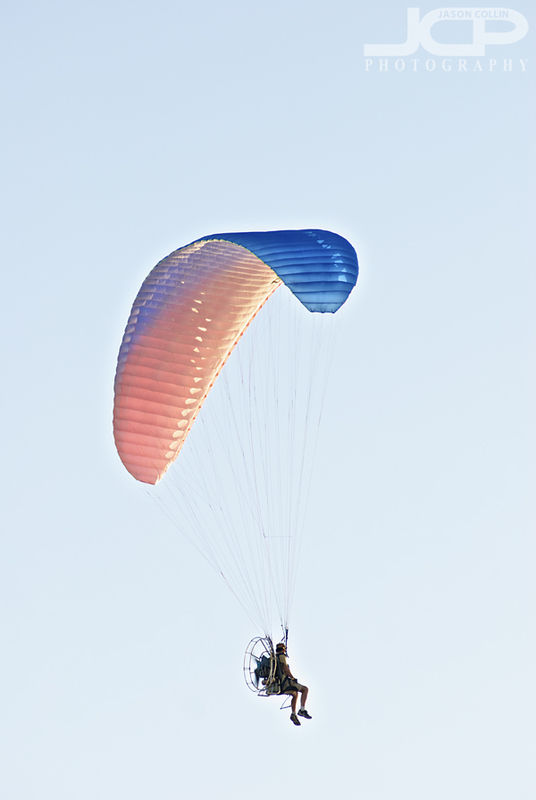 When I look at this powered paraglider I imagine the feeling of Freedom on the edge of danger is what he could be feeling. Another note about this photograph is that I made it in the middle of photographing a beach wedding. My photography tip for this type of shot is to of course be focused on the shooting on hand, but not so much so that one becomes unaware of the surroundings and what opportune shots may present themselves.